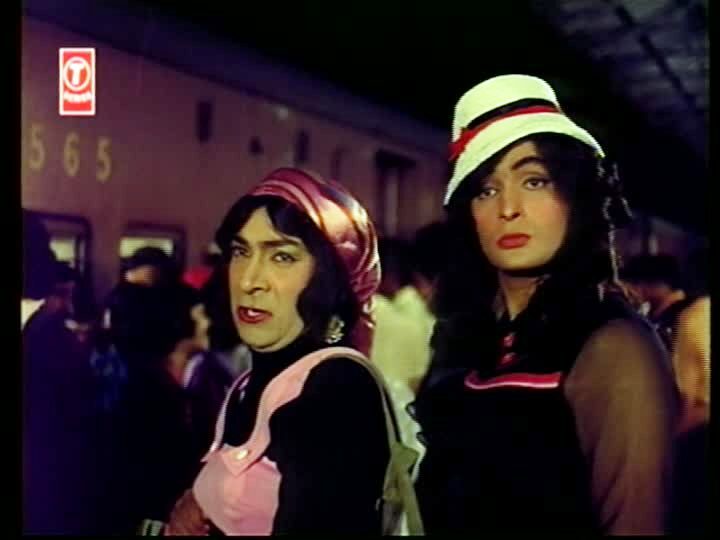 Inspired by the Billy Wilder classic “Some Like It Hot”, Rafoo Chakkar is a spirited romp that showcases the charm of the lead performers Rishi Kapoor and Neetu Singh. 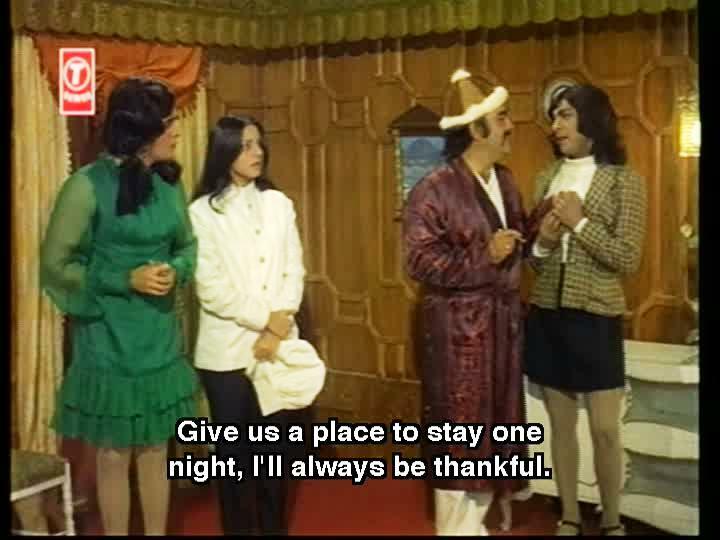 Some years later, Dev (now played by Rishi) and Salim (played by Paintal) are poor but honest musicians working at a wedding. The bride, Neetu Singh as Ritu, doesn’t want to be sold off to an old man – coincidentally Prakash the associate of Dev’s long lost father- and escapes before the ceremony with the help of her friend Shanti. Shanti has helpfully organised for Ritu to join a ladies orchestra touring Kashmir, far enough away to evade any parental pursuit. 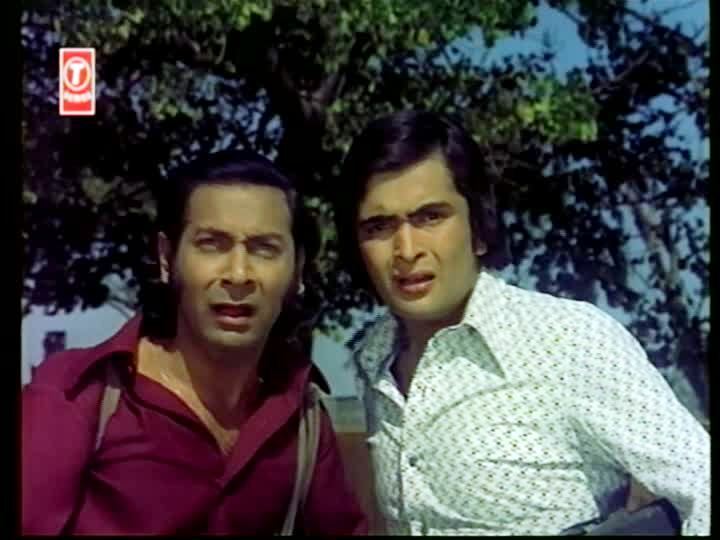 Meanwhile Dev and Salim witness a murder (guess who the murderer is!) and are forced to flee for their lives. They come into possession of a couple of suitcases of ladies attire, Devi and Salma are born, and the boys run away to join the ladies orchestra. It was quite fortuitous that the dresses fit the “girls”, especially as they have to audition for their place in the band as soon as they board the train taking everyone to Kashmir. We have to say, Rishi looks particularly comfortable in the ruffles and wig. Rishi falls for Neetu on first sight and once the band arrive in Kashmir, schemes constantly to be close to her. Paintal meanwhile catches the eye, and the heart, of a spectacularly attired Smuglani (Rajendra Nath). Ritu has told her new best friend Devi of her escape from an unwanted marriage and her plans to find someone young, handsome, loving and most important – filthy rich. Rishi, showing a level of manipulation and duplicity that is still oddly appealing, immediately assumes a new character – the knitwear and plaid clad loverboy Eknath Sada Shiv Omkar aka ESSO! As the owner of the large petrochemical company this new character is obviously rich enough to appeal to Ritu, and of course his wealth is only enhanced by Rishi’s other charms. 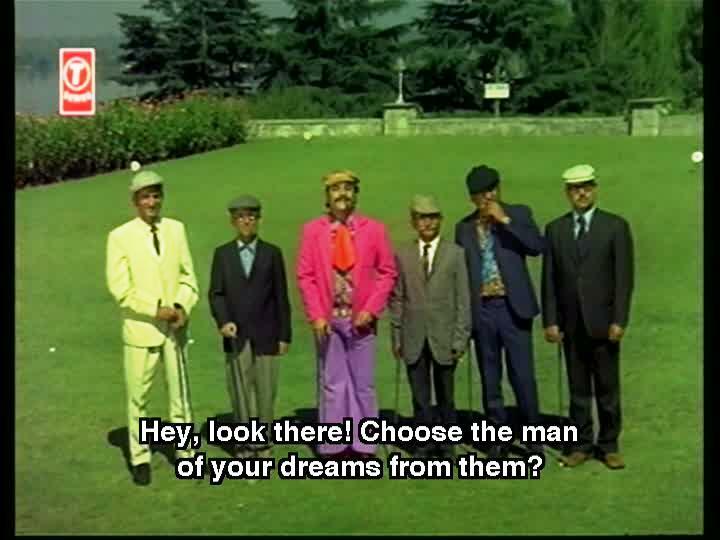 Paintal, who sounds eerily like Elmo at times, leads the wealthy and lonely Rajendra Nath a merry dance. Esso can then take full advantage of Smuglani’s houseboats and other assets as he impresses the lovely Ritu with his wealth. Of the two relationships, Salma and Smuglani seem to genuinely enjoy each other’s company whereas Dev and Ritu are (at least initially) playing a game based on surface attraction and aspirations. When Smuglani slips a diamond onto Salma’s finger and declares they are engaged, Salim explains to Dev that times have changed and that even he is entitled to his fairytale romance; citing a wish to have a dream wedding, house of his own and become a parent. Dev is understandably confused about this, and accuses Salim of falling for the diamond not the man. He also has to remind his friend rather forcefully that Salim is in fact not a girl, and that as such this romance will not last. However Dev is not above stealing the ring to use in his deception of Ritu, which says something about his character’s assessment of female affections as well as his own flexible morality. But it is Salim who makes Dev see that he must tell Ritu the truth, if only to see if she loves the man or the money. It’s the unconventional couple that seems to have the real heart. Rishi and Neetu are young, attractive, and expect the world to deliver them the object of their affections. Their love is of the typical filmi instant variety. Not quite truthfully, Esso tells Ritu that he has been disinherited and has nothing and if she still loves him they should meet tomorrow for a romantic duet in the meadows of Srinigar. They do, and warble convincingly of their undying love in the flower filled and sunlit meadows. Of course. Disaster looms as the mob arrive to stay at the same hotel for a world crime summit under the auspices of the ‘Chief’ – and in search of Dev and Salim who are known to be in the area. After a hotel corridor scene worthy of any French bedroom farce, the “girls” find a hiding place…under the banquet table of the crimelords. They are forced to witness an item number and hear a rollcall of evil doing planned for the coming year. Then the crooks go too far – Prakash recognises Ritu as his runaway bride and tries to abduct her. Ritu and the boys escape and run to Smuglani for help and a safe place to stay. Unfortunately Ritu recognises the houseboat and starts to question whether Esso was truthful. Heaping lie upon lie Rishi claims Smuglani must be the mythical brother responsible for disinheriting Esso. 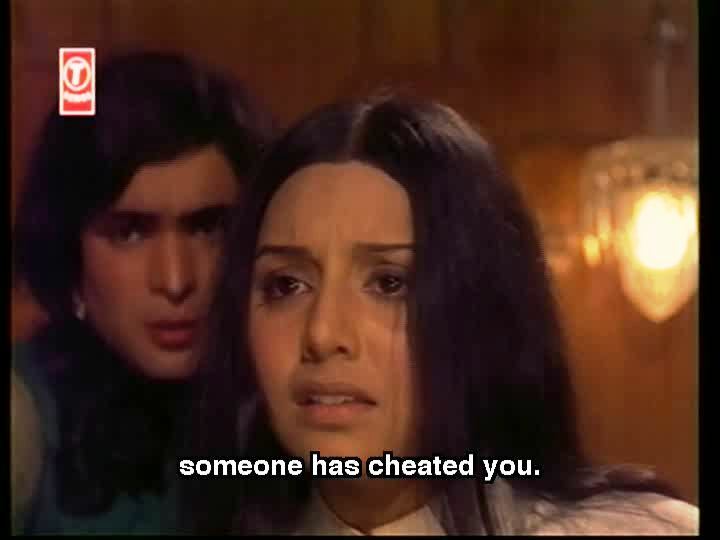 And then it becomes clear – Ritu has fallen for a cheat and a liar. As she bemoans her fate, and her loss of wealth, Rishi strips off his wig and earrings to reveal that he is fact Esso/Dev and Devi. Ritu rushes into his arms professing her true love. Why she didn’t ask a few pertinent questions is anyone’s guess. But their characters are the ambassadors for Filmi Love and there is no place for analysis or foreboding. The evil-doers have kidnapped the boys’ mothers to draw them out of hiding. More dodgy disguises follow as the good guys track down the bad guys at their lair. There are some confusing side plots as Prakash and Ranjeet try to assassinate the chief, and there appears to be an undercover police officer (Shetty!) in the mix. A swashbuckling fight breaks out after the obligatory exposition dialogues and everyone finds out they are related to everyone else. There are sword fights, chandeliers, backflips, a stunt cat and Neetu bashing folk with a big stick. Classic Errol Flynn derring-do, done with Kapoor panache. The two couples, because there are two, then sum up their relationships. Neetu and Rishi are happy in their puppy love and bask in each other’s beauty and admiration. 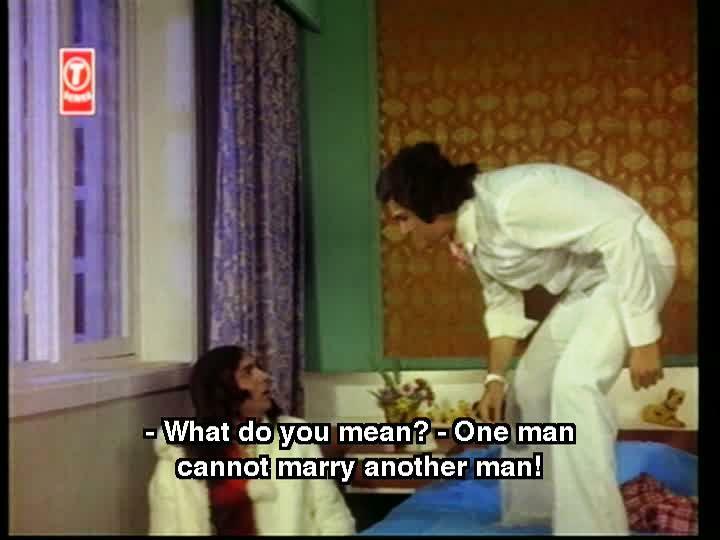 Paintal and Rajendra Nath explicitly address the same gender issue before Rajendra pursues his loved one off into the sunset. Love is love, and this seems to be a rather progressive filmi moment. As an aside, we have often speculated as to how Ranbir Kapoor reacted the first time he saw his mother in feathers, ruffled knickers and fishnets, with his father in a matching outfit. We hope he was as delighted as we were! We assume that moment would have happened when he first saw this film. But perhaps this just shows our non-filmi upraising! Heather says: This is a riot of a film that just seems to grab you and pull you along for the ride. Rishi and Paintal do look very comfortable in their dresses and make-up and are very convincingly feminine in some scenes. The romance between Neetu and Rishi does feel very artificial, but they are both so effortlessly charming together that I can forgive them for that. Paintal is wonderful as the friend who decides to make the most of his situation. Neetu is scintillating in the songs, and the romantic duet is just beautiful, despite the rather loud jacket worn by Rishi. At least he was easy to spot against the beautiful green fields. 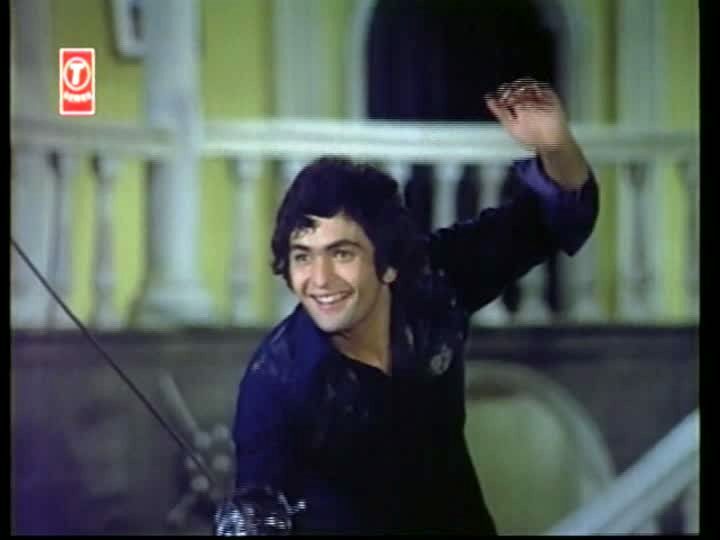 Rishi Kapoor is one of my favourite actors, and I love to see him dance – even if it’s in feathers and a frock rather than one of his more usual sweater and pants outfits. The final scenes seem somewhat rushed to me, and the conclusion a little confused, although the slapstick comedy works well. This movie wins points for the fact that the two main leads spend most of the movie in drag, and for the picture of Rishi and Neetu together. I give this film 4 stars! Temple says: This is a fun film, although not one that makes a lasting impression – despite the commitment to frocking up. 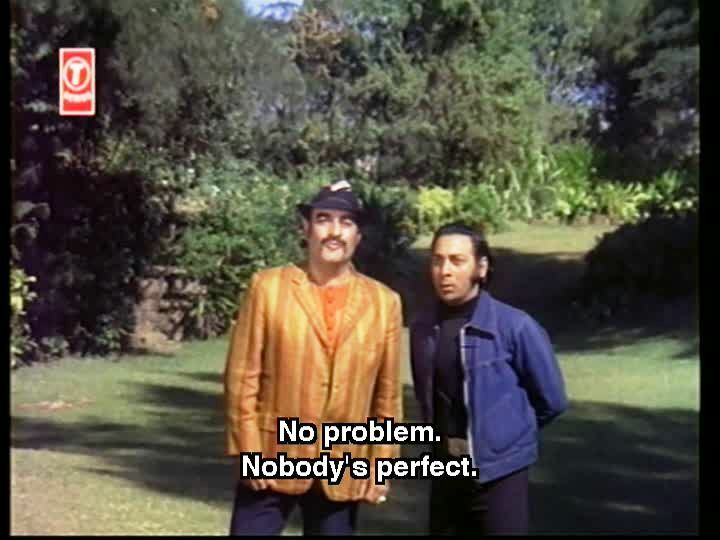 The actors all make the most of their characters, particularly Paintal and Rajendra Nath who manage to make some ridiculous dialogues seem really heartfelt. 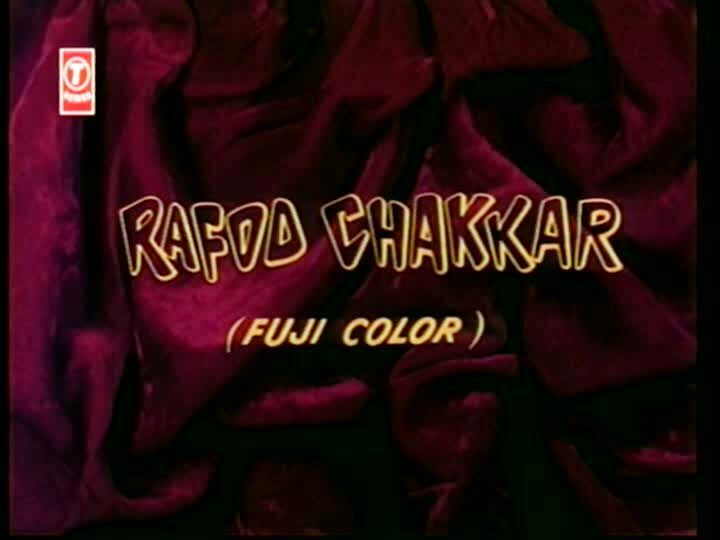 Neetu plays the decorative girlfriend for much of the film and her role doesn’t have a lot of substance despite the promising signs at the start of the action. She is charming, bright and lovely but it’s a pity she only had a handful of scenes where acting of any sort was required. Her expression when she realised Esso was a fraud was devastating. I am not such a big fan of Rishi as Heather is. Australian readers may understand when I say he bears too strong a resemblance to Daryl Somers for me to take him seriously as a romantic hero! Neetu and Rishi certainly had great chemistry in this, but I suspect that was personal chemistry on show. Dev’s manipulative and scheming behaviours were actually quite repellent and I couldn’t believe anyone would forgive him as easily as Ritu did. The songs are fun, the comedy is actually amusing, and the supporting cast give it their all. I give this 3 and 1/2 stars (points off for Dev being such a jerk). This entry was posted in Bollywood and tagged Bollywood, Neetu Singh, Neetu Singh-Along, Paintal, Rafoo Chakkar, Rajendra Nath, Rishi Kapoor. Bookmark the permalink. Oh Beth – Maybe this is why we’re friends? Despite our best efforts not to re-read your review, we still sound like we watched the film together! Of all the great things that fate has given Ranbir Kapoor, his parents must be #1. Especially in that song! I love this movie.